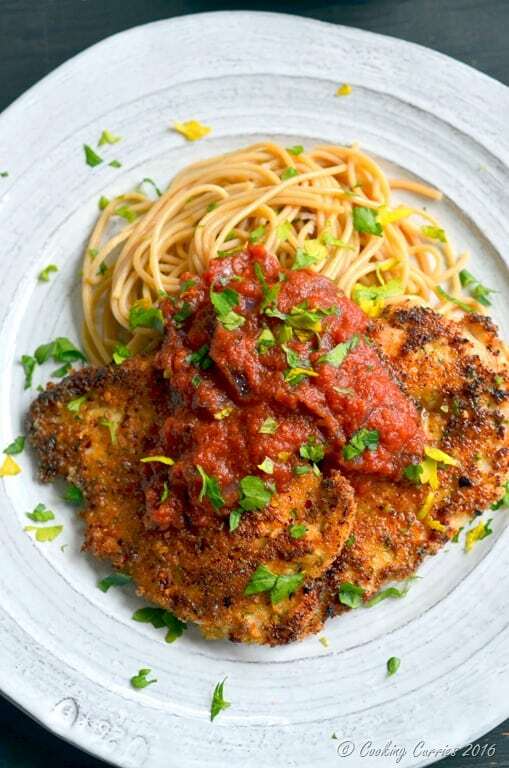 Nothing defines comfort food for a weeknight dinner than the simple and most flavorful Chicken Parmesan. For those of you who are born and raised here in the United States, there is nothing new about this comfort food. But for someone like AJ and me who came to this country in our 20s to start a new life, this Chicken Parmesan as an everyday comfort meal is something very new. To us, comfort food traditionally meant what our moms (or dads) made for us when we were growing up, what we turn to when we need that little pick me up. 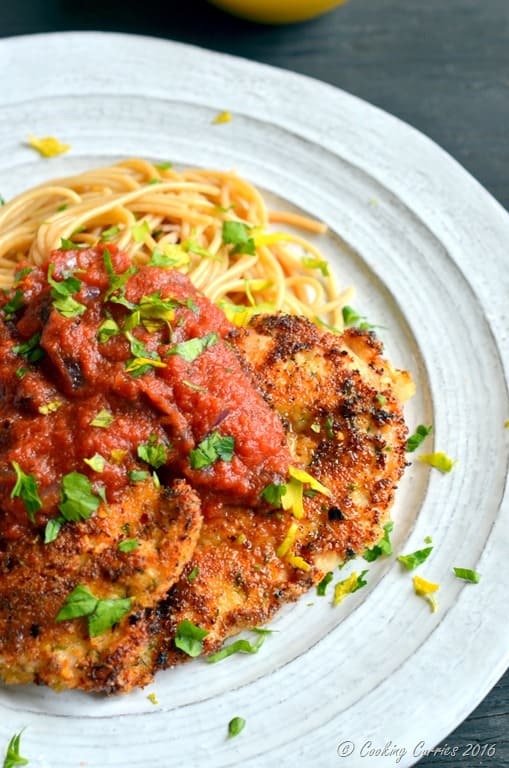 Over time, we have created new comfort foods for our life together and I think this Chicken Parmesan has soon become on – for AJ and the kiddo. I make a quick version of eggplant parmesan for me. Likes I said, comfort food can be what you ate and what comforted you when you grew up. Sometimes, you see someone else enjoying a little something different as a comfort food for them and in some way, I don’t know how, it makes you feel all warm and fuzzy inside and you feel comforted with it too. I always saw on television and in movies, where a chicken parmesan and a pot roast, seems to be the thing that moms made for their kids when they came back home or was implied as a comforting family meal. When you hear that over and over again, you cannot help but try this out to see what is so comforting about it. Well seasoned chicken breasts, breaded and shallow fried along with everyone’s favorite spaghetti and marinara sauce. What can be more comforting than this?! ( The little Tam Brahm girl voice inside me is shouting “curd rice”) But you know what I mean. This defines what the New Comfort Food is – comfort food that is comforting to you but made with as much minimal, fresh, local ingredients as possible. 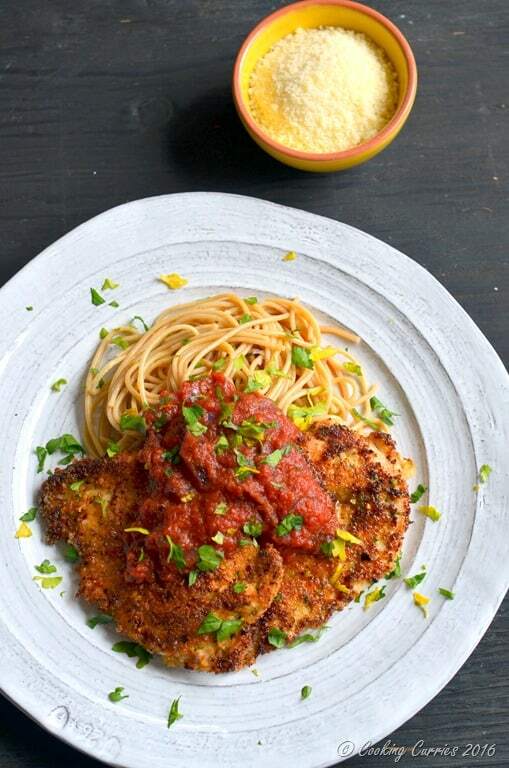 Today, I bring you this recipe for Chicken Parmesan that is made to be a New Comfort Food, knowing that the chicken used in this is very local to you here in the Pacific Northwest Region. 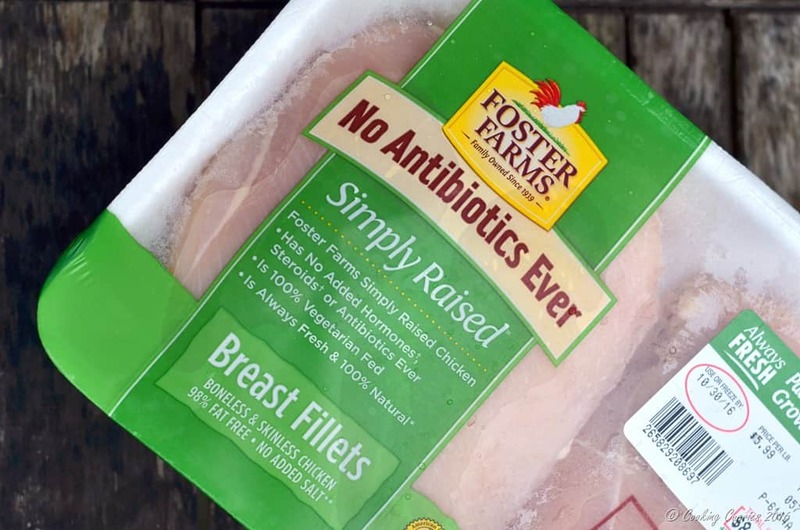 Foster Farms Simple Raised Chicken is all about fresh chicken that are 100% vegetarian fed and there never is any antibiotics or hormones used! Now, that is so very important to me and it should be to you too! And there’s more. It is also fresh all natural chicken that is American Humane Certified. That is a huge win win in my books. Not only am I safe and secure in the knowledge that I am feeding my family something that is good for them but also that the birds are humanely treated! Excited to know more about Foster Farms Simple Raised Chicken and what else you can make for a quick dinner with them? follow this link to get access to many many more delicious comfort food recipes! Cut each chicken breast into half, such that you are thinning the thickness of the chicken breast. Place each half over a sheet of cling wrap, cover with cling wrap and beat with a kitchen mallet to flatten it to roughly 1/4 inch thickness. Season both sides with salt and pepper and keep aside for 10 mins. In a shallow bowl, beat the egg and keep aside. In another shallow bowl, mix the parmesan cheese, bread crumbs and Italian seasoning together. Heat oil over medium heat in a skillet. Place a flattened chicken breast in the bowl with the egg and cover both sides with the beaten egg. Place it on the cheese / bread crumb mixture and coat with the mixture. Repeat with the other chicken breasts. Place the chicken breasts in the heated skillet. Cook each side for 10 mins or so, until crispy and golden. Cut a small piece to make sure it is cooked. 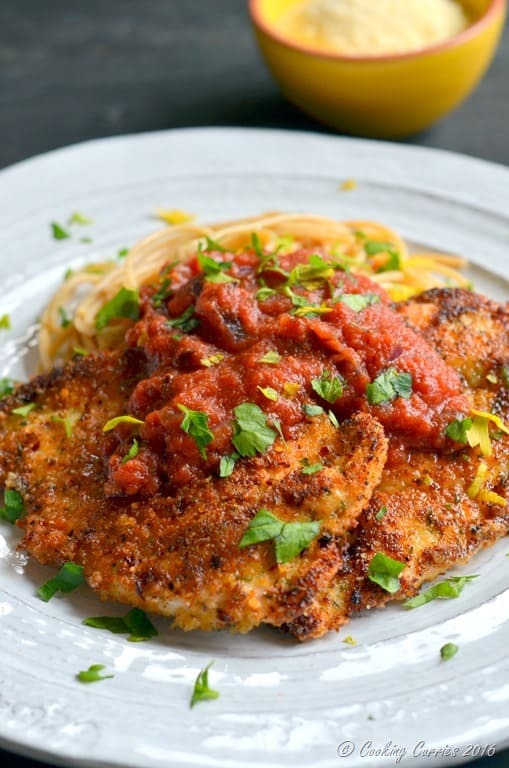 Top your favorite whole grain spaghetti with the crispy chicken parmesan and top with your favorite marinara sauce. Garnish with minced parsley.